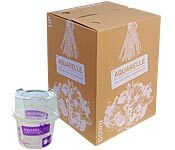 Aquarelle.es was born in June 2000 of the association between Aquarelle.com, the undisputed French leader in online flower sales, and BÚCARO, a prestigious Spanish florist with over 30 years of experience, renowned for its impeccable quality. The result is the perfect combination of skilled floristry and technological expertise. In our online catalogue, you will find a large choice of bouquets. You can also choose from a range of prices and we will adapt the bouquet's size and composition accordingly. Unlike other flower transmission networks, Aquarelle.com controls the entire fabrication process and composes exactly the bouquet you have chosen to offer. For every order you place, you will receive an e-mail with a link to a photo of the bouquet composed especially for you, taken just before it was dispatched. Romantic, perfumed or exotic... our collection of bouquets changes with the seasons, the events which mark the year and our florists' inspirations. We're sure you'll love discovering our « Market Bouquets » of lavender, sunflowers, ranunculus, peonies or hydrangeas, cultivated and hand-picked by our own growers and selected partners and arranged in beautiful, hand-tied bunches. 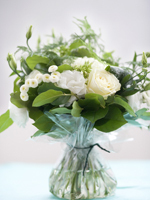 Aquarelle's florists design, compose and hand-tie your bouquets on our own premises. With fresh arrivals of flowers every day, our florists take the greatest care when creating your bouquets to ensure that you enjoy them for as long as possible. We wrap the stems of each bouquet in a special gel guaranteed to keep your flowers fresh. Our fast delivery service ensures that your bouquet will reach its destination in perfect condition. Our bouquets are packaged in a specially adapted, waterproof box, so your bouquet is transported in the best possible conditions. Our express delivery service is based on the highest quality, time-proven logistics.